Summer hats tend to all look the same to me, so when one catches my eye it's sure to be stand out! 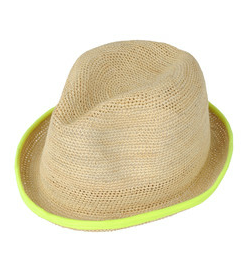 It's not crazy of over the top, but the neon yellow trim on this woven hat definitely takes it from classic to bold! Also in organe trim, buy at TheCorner for the sale price of $75.